Obituary for Mildred L. Campbell | Adams Funeral Home Ltd.
Mildred Luella Campbell, widow of the late Howard Campbell of Miramichi passed away at her residence on Thursday evening, January 24, 2019 at the age of 89. Born in Napan, on August 20, 1929, she was the daughter of the late Samuel and Ruby (MacNaughton) Lockerbie. 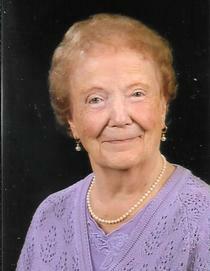 She was a school teacher for 35 years and was a member of St. Andrew’s United Church. Mildred is survived by her son: Ralph Campbell (Kendra) and two grandchildren: Alex and Kate. She was predeceased by her parents and husband Howard Campbell. Visitation was held at Adams Funeral Home Ltd., 140 King St., Miramichi on Wednesday from 2-4 pm. Funeral service was held at St. Andrew’s United Church on Thursday, January 31, 2019 at 11 am with Rev. Charlene Maguire MacKnight officiating. Music for the service was provided by Bill Sweezey, Ken Simpson and St. Andrew’s Church Choir. The hymns were “The Lord’s My Shepherd”, “Abide With Me” and the recessional hymn was “Go Now in Peace”. The lighting of the Memory Candle was done by Alex and Kate Campbell. Scripture readings was read by Alex Campbell and a poem “Footprints” was read by Kate Campbell. The eulogy was given by Merle Milson. Retired teachers sat as a body for the service and formed an honour guard. Pallbearers were Olden Court, Frank Dickson, Frank McFarlane, Paul Sweezey, Lloyd Godfrey and Rick Hayward. Interment will be held in the Riverside Cemetery later in the spring.